What could be more adorable than a Zhu Zhu Hamster? Well a Zhu Zhu Puppy of course. There are six different puppies for you to collect and love, and they are so cool. You don’t have to take them for a walk or feed them or poop scoop, they are just perfect and they don’t bark or bite or smell. Your mum and dad will love them. Put them on your birthday or Christmas list now. Which one will you choose, they are all so cuddly and soft and come in a variety of colours and each puppy has his own funky comb and his own unique and very cute sounds. Dakota is grey and white, Howser is purple and white, now that’s cool, Loolah is pink, very glamorous, Miss Priss is grey and white with a pink bow in her hair, Murphy is ginger and very, very cute and mischievous and last but not least is Sabrina who is pure white. 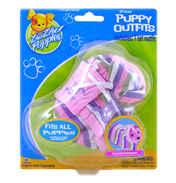 You can have endless fun playing with your Zhu Zhu puppy or dressing him in one of six different and very trendy outfits. Take him to the Bark Park or to the Grocery Store or let him play in one of the Push Alongs. If he is feeling poorly put him in his Puppy Carrier and take him along to the vet, oh dear he’s not going to like that is he? 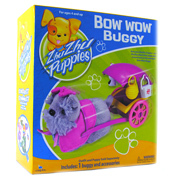 If you have nobody to play with you’ll never be lonely or bored, you have your faithful Zhu Zhu puppy who is always ready to play. Which one will you choose, if you can’t make up your mind give them all a home.